The tour starts out with Bradenton Beach, one of the nicest beaches on Anna Maria extending along the Gulf of Mexico. This is a family oriented beach and the water is typically calm with light surf. 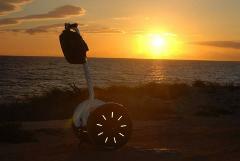 Sandy dunes, Australian Pines and Sea Grapes shade the sidewalks for the Segways. Next it’s onto Cortez Beach and Coquina Beach. Coquina Beach, located on the south end, is the longest stretch of beach on Anna Maria. Remnants of old piers jutting out into the water (dividing sections of the beach) make it a choice spot for surfers. Then we'll glide over the Longboat Key Bridge, where dolphins are often sighted, as we make our way onto world famous Longboat Key. The tour will head to Joan M. Durante Park in the Town of Longboat Key. The park offers a unique look at the Sarasota bayfront environment. A wetland and coastal hammock forest provides access to a diverse mix of plants, animals and ecosystems typical of coastal Southwest Florida. Then it's time to turn around and make our way back to historic Bridge Street along the Coquina Trail.